Alia Bhatt is the latest celeb on Kangana Ranaut's radar and the Queen actress leaves no opportunities to take a dig at this 'young' actress. Okay, she even has some issues with the fact that we call Alia 'young'. From criticising her recent performance in Gully Boy to calling her a spineless person, Ms Ranaut has spoken some harsh words against the actress and mother Soni Razdan is clearly upset about it. There's no reason for Kangana to target Alia, yet she continues to blame and accuse her and Soni believes she has had enough of it. Did Randeep Hooda Just Call Kangana Ranaut a 'Chronic Victim'? The Actor's Tweet Defending Alia Bhatt Suggests So! When a Twitter user asked Soni Razdan about why Kangana is spewing hatred for Alia, she replied to the user by questioning her loyalties. Mahesh Bhatt is the man who has given her a break ... she goes on to attack his wife and daughter. Daughter over and over again. What is left to be said then about abusing and hatred I wonder. Apart from character of course. Agenda ? What’s hers...? she tweeted and we wonder if that's going to ignite another war of words. 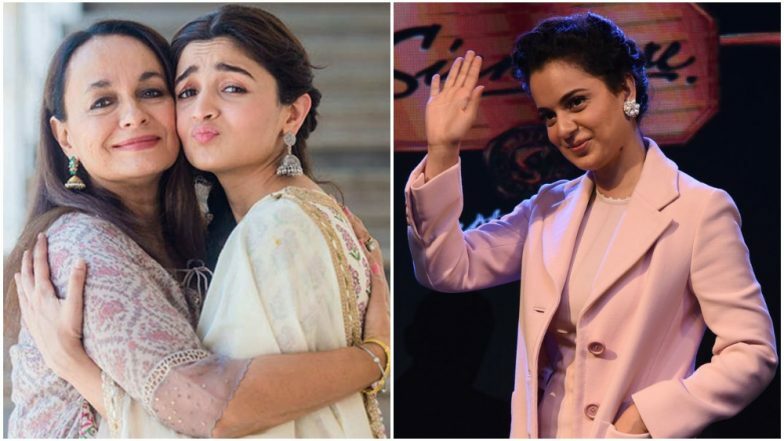 Alia Bhatt Has a Mature Response to Kangana Ranaut's Criticism for Her Gully Boy Performance. Recently Kangana's sister, Rangoli, targeted Randeep Hooda who came out in support of Alia. From calling him a 'failure' to accusing him of mistreating Kangana on the sets of Ungli, Rangoli lashed out at him for his kind words for Alia. Guess, we can already predict some more statements coming from the Ranaut camp and this time for Soni Razdan.